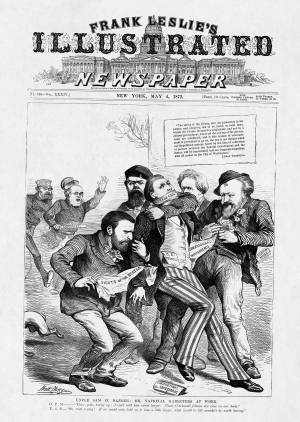 In print on April 24, this issue editorialized that the leading candidates for the Liberal Republican presidential nomination "in point of strength, ability and influence" were Horace Greeley, David Davis, Charles Sumner, Lyman Trumbull, and Carl Schurz. The opinion of Leslie's editors concerning Greeley's candidacy was, however, the minority view. Most observers pegged Charles Francis Adams (conspicuously absent from Leslie's list) and David Davis as the top candidates. Greeley was not generally considered a viable presidential candidate, particularly because of his trade-protectionist stance, although he was thought to be a possible vice-presidential nominee.